Key Difference: A grinding mill is a unit operation that is designed to break down a solid material into smaller pieces. A factory on the other hand is a building or a set of buildings that contain plants, equipment or machinery that is used to manufacture or produce goods or machinery. The term factory and mill are often confused as one and the same thing, though they have completely different meanings. While a mill refers to a building that is fitted with machinery that is used for grinding, a factory is a place where products or goods are manufactured. A grinding mill is a unit operation that is designed to break down a solid material into smaller pieces. Prior to the Industrial Revolution, a mill was used to describe a factory as during that time water mills were used to run them. However, the term ‘mill’ was changed to only refer to cotton mill, sawmill, textile mill, paper mill, sugar mill, silk mill, rice mill, etc. In each of these mills, raw materials are grounded into small substances. Historically, mills were powered by hand (mortar and pestle), working animal (horse mill), wind (windmill) or water (watermill) but are now powered by electricity. A mill can also be referred to as a subset of a factory as it creates substances that are used to manufacture other objects or materials. Mills do not require as much capital, resources or labor as factories do. A factory on the other hand is a building or a set of buildings that contain plants, equipment or machinery that is used to manufacture or produce goods or machinery. Factories or industries saw a boom after the Industrial Revolution, which increased demand for goods and products. A grinding machine that is used in a mill is also developed in a factory. Factories require a large store house in addition to the building in order to store the raw materials or the finished products. In order to run a factory, a person requires capital, large workforce and resources. In comparison to mill, factories are much bigger and require a much larger capital. Factories may either make discrete products, such as parts and components or some type of material continuously produced such as chemicals, pulp and paper or refined oil products. 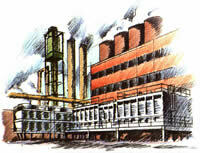 Factories require energy, usually heat, electricity or both, to transform raw materials into finished product.